Trevor Pateman's Philately Blog: Russia's 1990s Inflation - a Catch 22 cover? 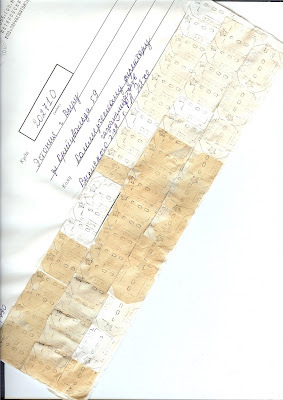 This crazy cover was sent from MOSCOW 03 09 93 using an unmodified Soviet-era franking machine only capable of reaching 999 kopecks (9 roubles 99 kopecks). A clerk (either working through the night or with only one letter a day to frank)has assembled 94 cut outs (front and back) on this cover in addition to the single regular frank at top right. I am not very good at arithmetic, but I reckon the franking totals 841 roubles (there are franking labels for 100, 500 and 700 buried among the 900 labels). The Manuscript at bottom left suggests someone had calculated a postal charge of 780 roubles for 100 grams. But there is a catch: the labels when gummed (and boy are they gummed)add significantly to the weight of the envelope. So maybe the weight step changed. Or maybe we are all bad at arithmetic.